I was thinking about going to Exeter at the weekend for a few days and E had said that she wanted to come with me, I did highlight to her that I would be going shopping. 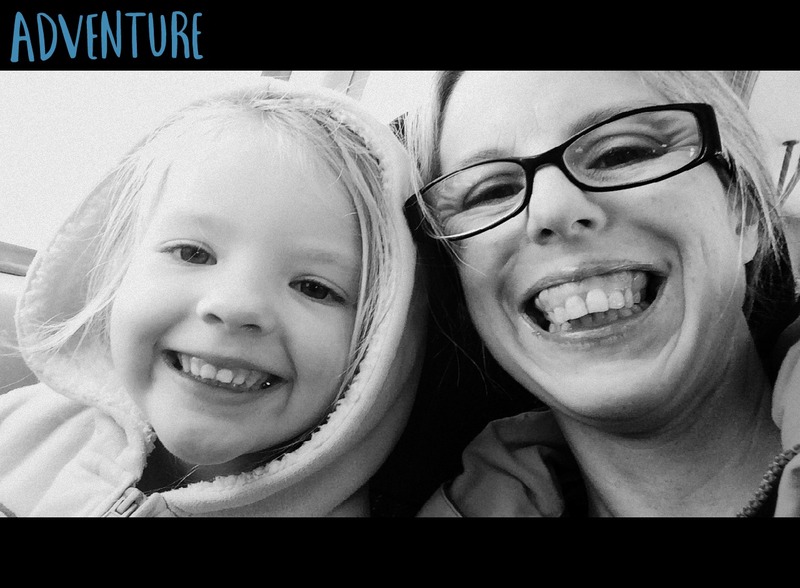 She still wanted to come along, I think she loves having some time alone with her mummy and she also knew that we would be having lunch in Exeter. So Saturday morning arrived and I decided that after E’s swimming lesson we would go on a little girly trip to Exeter. As I don’t drive E and I always catch the train to Exeter, and living by the seaside means that the journey into Exeter is really picturesque. 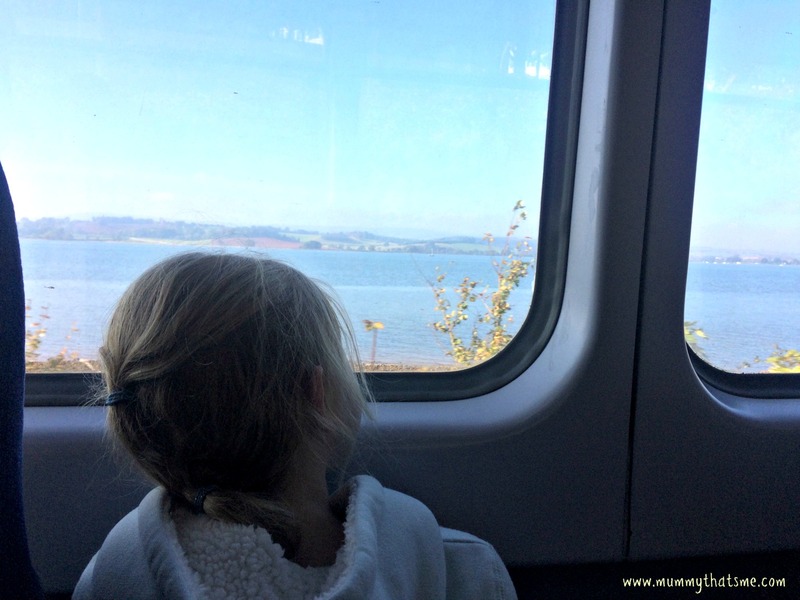 E always makes sure we sit on the ‘seaside’ side of the train. E likes to sit on her knees so she can get a better view and then proceeds to tell me everything else she can see, it’s all really cute. Whilst walking into town from the train station we decided to cut through WHSmith as E says it is a quicker to get to the shops. 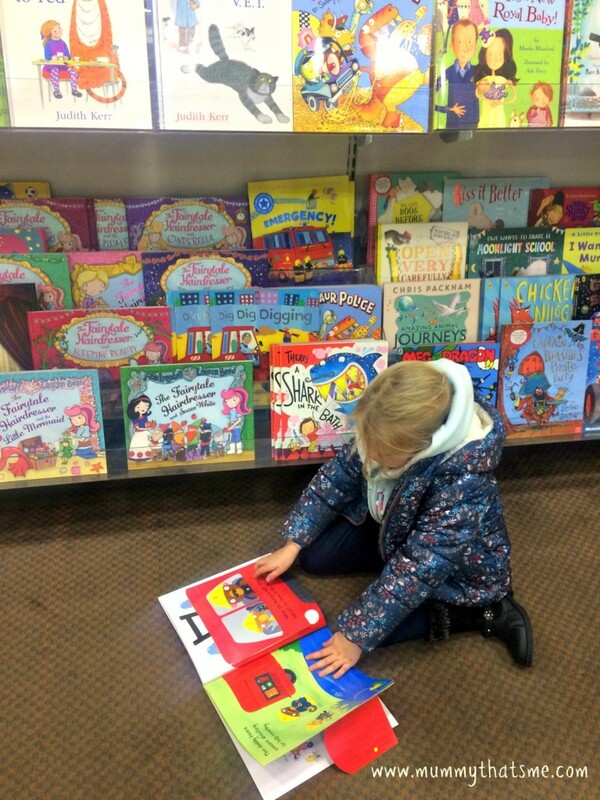 As soon as we got in there she made a bee line for children’s books, she really is a little book worm. I managed to get some shopping done, after all I had gone there with a purpose, the kids need to stop growing, they always need something new because they have grown. But as expected with E there the day wasn’t as productive as it could have been, however she was really good and got excited about seeing Christmas stuff in the shops and getting to look at toys. 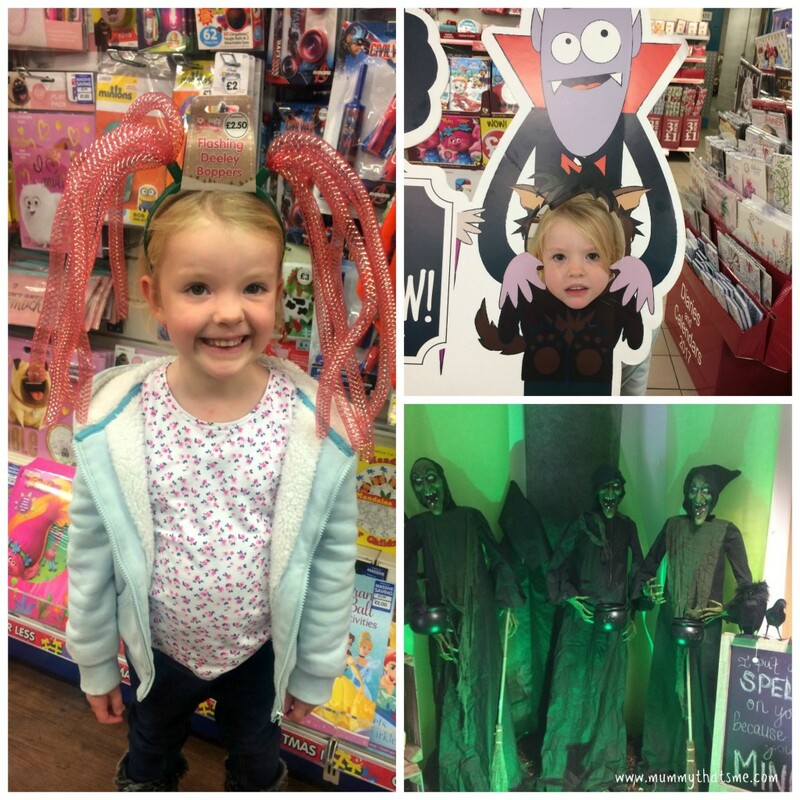 As we were walking down the high street I spotted a shop called Halloween HQ, a fellow blogger had mentioned a Halloween shop but I had forgotten about it until we stumbled upon it. 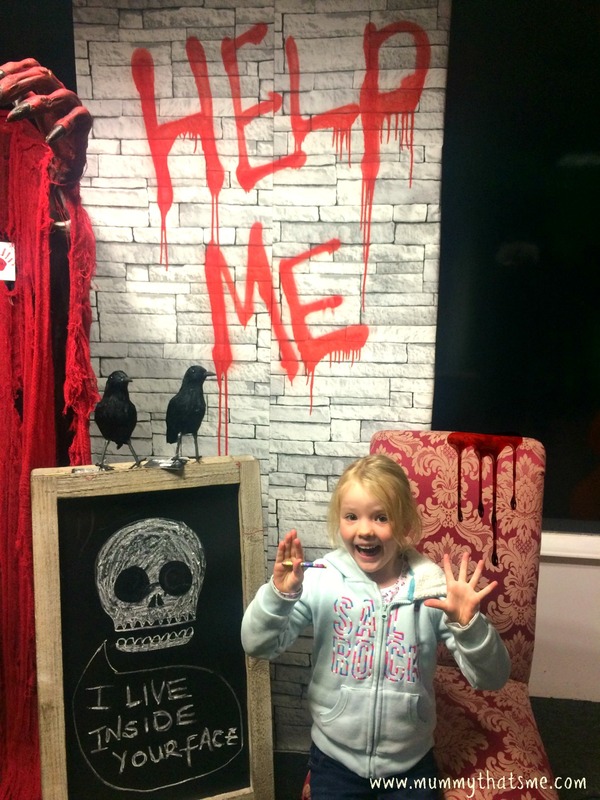 We decided to go in but I was watching E’s reaction as I dint want it to scare her, but it didn’t, she absolutely loved all the special effects and the flying bats and Zombies. There are plenty of photo opportunities in the shop which E thought was great. This particular photo really makes me laugh, she was reading what everything said and loved it. Next to it you can see a red hand, that was some seriously freaky red demon whose eyes lit up, E however thought it was amazing. There are lots of great displays in the shop, one being a dinner table set up using the party stuff you could buy and around the table there was four skeletons eating eye balls, hands and other gruesome food, E asked if we could buy some.. eer no was my answer. A few of the adults were smiling and laughing at E as she was so excited and loved it all, it’s no surprise that there wasn’t many children in there at all. 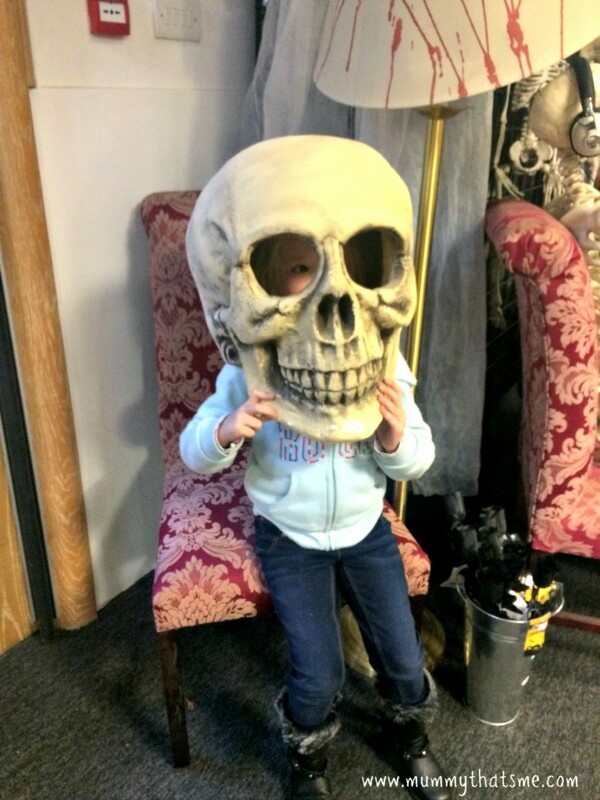 When E picked up this light weight skull and put it on, I really could not stop laughing, there is something funny and yet not quite right that a five year old thought this was, in her words, awesome. I think out of all of the shops we spent the longest in here and even then she didn’t want to leave and asked to go back in on the way home. I treated E to lunch which she loved, I am sure she only comes along for the lunch out, after which we did some more shopping and she was keen to point out a few items of clothing she liked and enjoyed trying things on. I think as she grows older she is going to a girly girl who loves to go shopping, after all most girls/women do. it was getting late and I was ready to go home, its amazing how tiring shopping is, so armed with shopping bags and a few treats we headed back to the train station to head home. 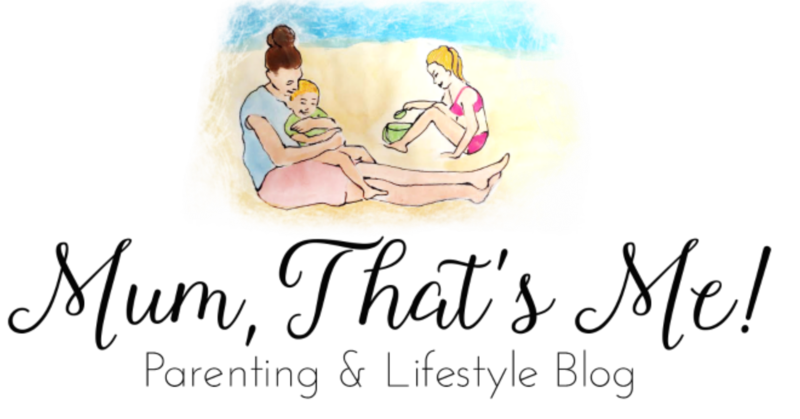 All in all we both had a great day, some fab girly time and E didn’t moan once, we were both ready for a good rest and E fell asleep as soon as her head hit the pillow and had a great nights sleep..
Year one at school so far..